Another iPad sleeve! I’m a little slow. My friend Colleen designed this in November I think. Oops. Sorry Addie. Although you didn’t know about it so you can’t be too mad. I hope the sleeve keeps your iPad nice and warm. The inside is stripes. I liked that little touch. I like that this looks Valentine’s Day themed given the current time even though it really is not. The center fabric is from my mom’s old fabric section, and is super cute. 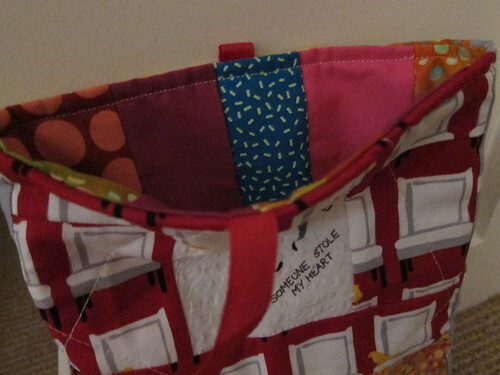 This entry was posted in Sewing and tagged iPad sleeve. Bookmark the permalink. This turned out super cute – although ‘designed’ is a little strong. 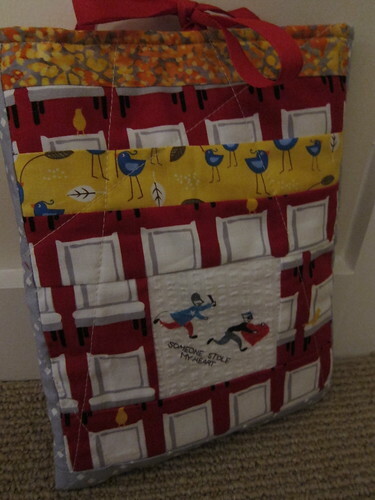 I believe the conversation was more ‘well Addie like animals and the I stole your heart fabric is adorable. Use that.’ I love the stripes!